Make the most of your casino’s sports sponsorship investment with a giant-prize promotion from Odds On. Odds On Promotions offers hundreds of fan-pleasing, customizable sports contests that are designed to build brand awareness, capture media attention and drive traffic to your property. 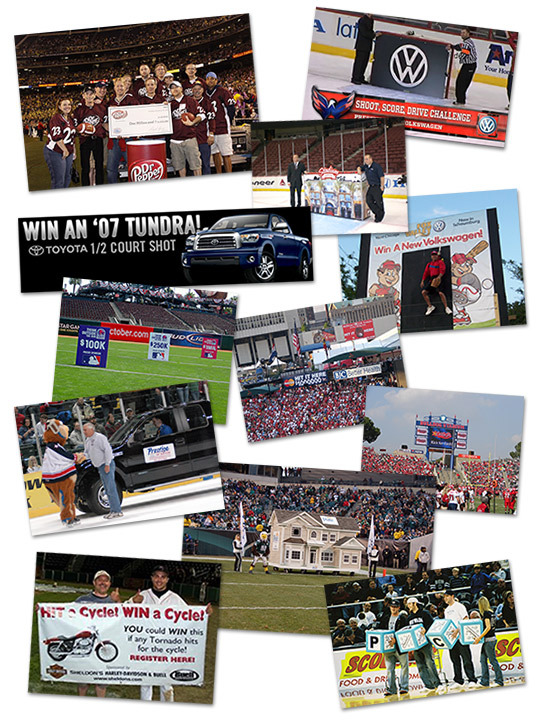 Text, Match & Win is an affordable and effective promotion for increasing excitement in any sports venue. It’s easy! Odds On will create a custom text campaign featuring your prize, sponsor and optional coupon. Simply advertise your contest before and during the game instructing spectators to text an applicable KEYWORD to "31996" and watch the score board for their chance to win. If the numbers they receive via text match the ones revealed on the customized video playback (provided by Odds On), your lucky spectator wins the big bucks, and Odds On will be there to pay for the prize. 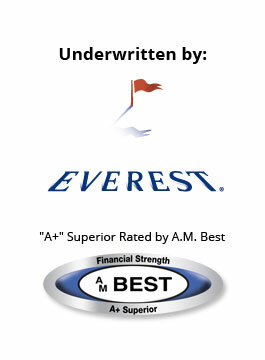 Learn more about Text, Match & Win. 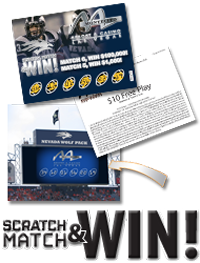 Put the chance to win in every fan’s hand with Odds On’s Scratch, Match and Win video board promotion. Odds On will customize a 3” x 4” scratch card featuring your prize, your property logo, and a custom bounce back offer designed to drive traffic back to your casino. 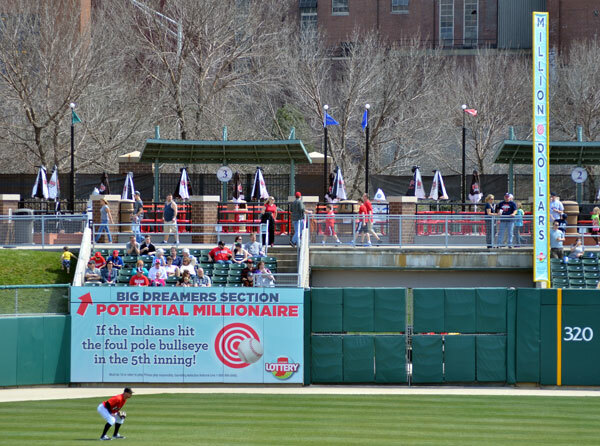 Distribute the cards at designated games, instructing fans to “scratch” their cards and watch the video board. If the numbers on the fan’s card match the ones revealed on the customized video playback, a lucky fan will win the big bucks and Odds On will write the check. Learn more about Scratch Match & Win. Here’s a promotion that’s not only guaranteed to turn a few heads, but is a fun way to showcase your Table Games department: a giant prize Dice Roll. Odds On will customize a set of eye-popping 16" dice featuring your property name, logo or the prize that you’d like to give away. If a randomly selected fan – or group of randomly selected fans – can roll C-A-S-H, W-I-N-B-I-G, M-I-L-L-I-O-N, etc., Odds On Promotions will pick up the tab. Take any big play and make it worth really big bucks with any of Odds On’s customizable Prize Play sports promotions! Imagine the publicity when you reward a lucky fan with $100,000, $500,000, or even $1,000,000 if a grand slam occurs during a particular inning, a hockey player scores a hat trick, if there’s a half-court shot at the buzzer, or if the opening or second half kickoff of a the big game is returned for a touchdown. Plan on taking VIPs to a particular game? Odds On’s can craft a Prize Play that will reward your players if a particular play occurs during the game. Sponsor a section at the local arena or stadium? Odds On can assist you in crafting a sponsorship package where everyone sitting in your section will take home the cash if a particular play occurs. And no worries, when the crowd goes wild, Odds On will be there to pay for the prize! Give fans the chance to kick, toss, swing or shoot for cash and prizes paid for by Odds On! Odds On offers on-field Sports Contests for every venue as well as online contest registration that makes registering and selecting contestants as easy as 1-2-3.